For today's card I'm using CPS Sketch 98 as my inspiration and one of the dog images from Rare Image Rubber Stamps Pet's Plate. Isn't he sweet! My focal image was stamped in Fresco Chalk Ink on Vanilla, then cut with my Oval Nesties, layered on a Chocolate Chip Oval. 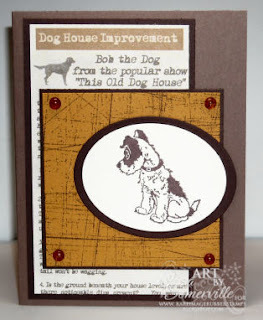 I stamped the Sanded BG in Fresco, layered it on Chocolate Chip then onto my Karen Foster Design Dog Chronicle Paper, and to my base card as shown. Cute card Lisa! I love the colors you have chosen for this. How cute!! Love that doggie stamp! Thanks for playing at CPS this past week!